Heuchera 'Prince'. Rich bronze to dark purple foliage is crowned off with white flowers on purple-red stems. 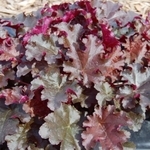 The ruffled margins give you a glimpse of the maroon-red undersides. Seasonally it transforms into a shiny near-black mound of compact foliage.